Tripp Lite's 3.05 m (10-ft.) DVI - HDMI (High Definition Multimedia Interface) cable allows interconnection between digital display devices, such as DTV's (Digital Television), Plasma displays, LCD TV's, and projectors, to Digital source devices, such as Digital Set-Top boxes, DVD/DVD-R players, and AV receivers. HDMI DTV's will display video received from existing DVI-equipped products, and DVI-equipped TVs will display video from HDMI sources. HDMI technology uses a much more compact and user-friendly connector than the existing DVI connector. The HDMI specification handles higher-bandwidth, uncompressed video, and multi-channel digital audio, all in one neat cable solution. 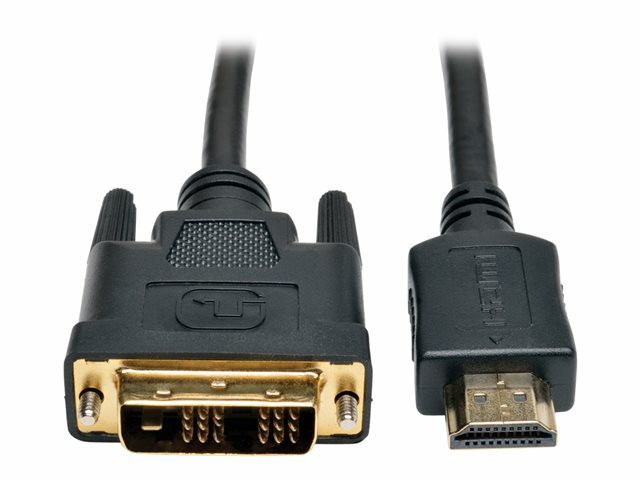 (DVI-HDMI cable supports video digital only).